I was just very pleasantly surprised that the subtitling interface in YouTube has gone leaps and bounds since I last looked at it. 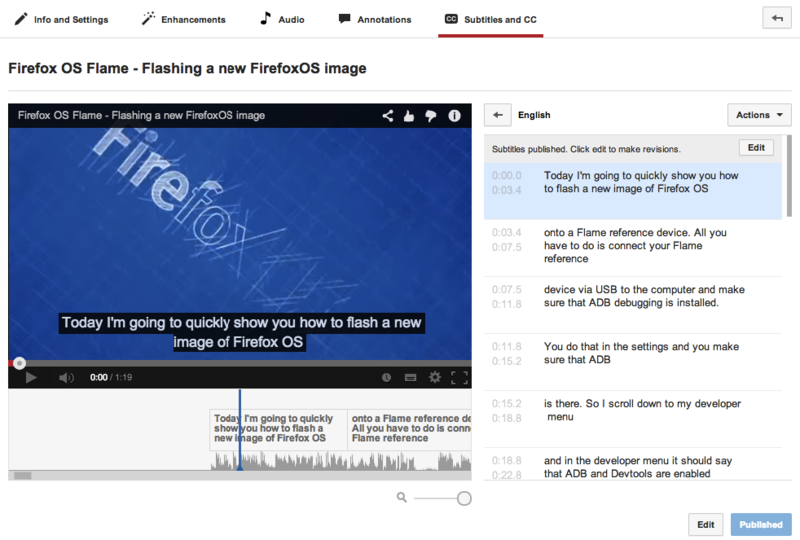 One of the French contributors to Mozilla asked me to get subtitles for the video of the Flame introduction videos and I felt the sense of dread you get when requests like those come in. It seems a lot of work for not much gain. I just went to the Subtitles and CC tab and told YouTube that the video is English. Almost immediately (this is kind of fishy – does YouTube already create text from speech for indexing reasons?) I got a nice set of subtitles, time-stamped and all. Hitting the edit button I was able to edit the few mistakes the recognition made and it was a simple process of listening as you type. I then turned on the subtitles and exported the SRT files for translation. I was very impressed with the auto-captioning as I am not happy with the quality of my talking in those videos (they were rushed and the heartless critic in me totally hears that). Of course, there is also Amara as a full-fledged transcribing, captioning and translation tool, but there are not many excuses left for us not to subtitle our short videos. You help people with various disabilities to make your work understandable. Go, hit that Subtitles tab!